Over the years I’ve been reviewing batches of fairly conventional papers, be they matte or gloss/luster and observing the growing diversity and maturity of conventional inkjet printing using these papers. It’s safe to say the industry has reached a high level of maturity with its conventional offerings, improvements being evolutionary rather than revolutionary – their main contribution is to offer some refinement of features and more user choice of paper characteristics. That remark applies to two of the offerings on tap in this article; however, the other five are specialty products that challenge conventional analytic approaches and conventional kinds of usage. So I’ll discuss the conventional offerings first, i.e. the “+ Some” of the title, then turn to the specialty products. 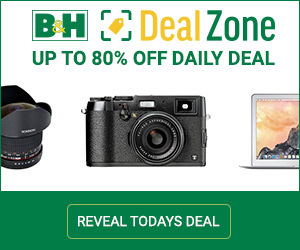 The conventional offerings are Hahnemuhle Photo Rag Baryta (HPRB) and Canson Baryta Prestige (CBP). Both of them are solid, wide-gamut (Photo Black ink) performers with some special characteristics that I found attractive. I’ve tested these papers and the five specialty products in both Epson P800 and Canon Pro-1000 printers. As I’ve done in my other paper reviews, I emphasize technical factors such as gamut volume, profiling accuracy (OEM and custom), grayscale and Black rendition, because these are at the heart of how the papers can perform in producing satisfactory “real world” prints. HPRB contains Baryta (PK ink) with a luster-like finish on cotton rag substrate. It has no OBAs, weight is 315 gsm, thickness 15.4 mils, and is acid free and calcium carbonate buffered. It is offered in a variety of sheet and roll formats, as well as 4 x 6 and 5 x 8 inch photo cards. 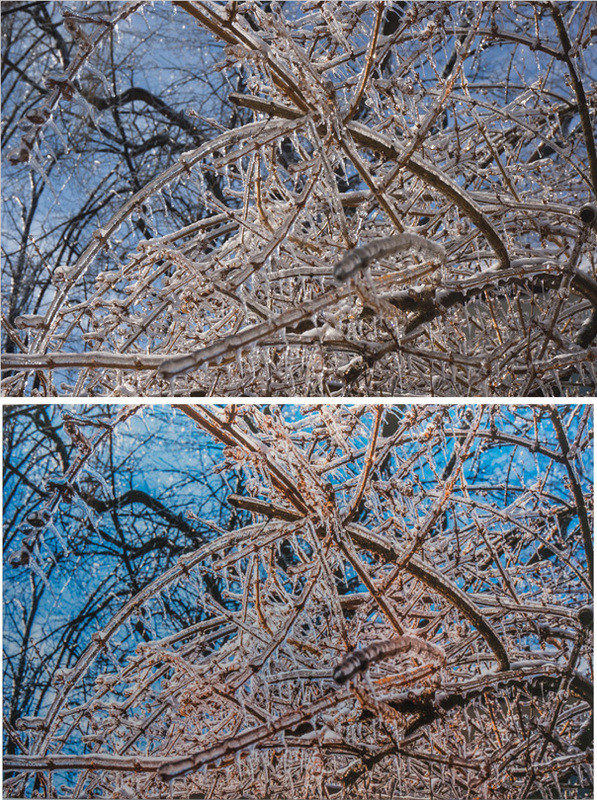 While Hahnemuhle describes the paper as “high gloss”, I find its glossiness rather luster-like, and the surface, while not entirely smooth, is more finely but obviously textured than papers such as Epson Legacy Baryta, Ilford Gold Fibre Silk or Canson Baryta Photographique. 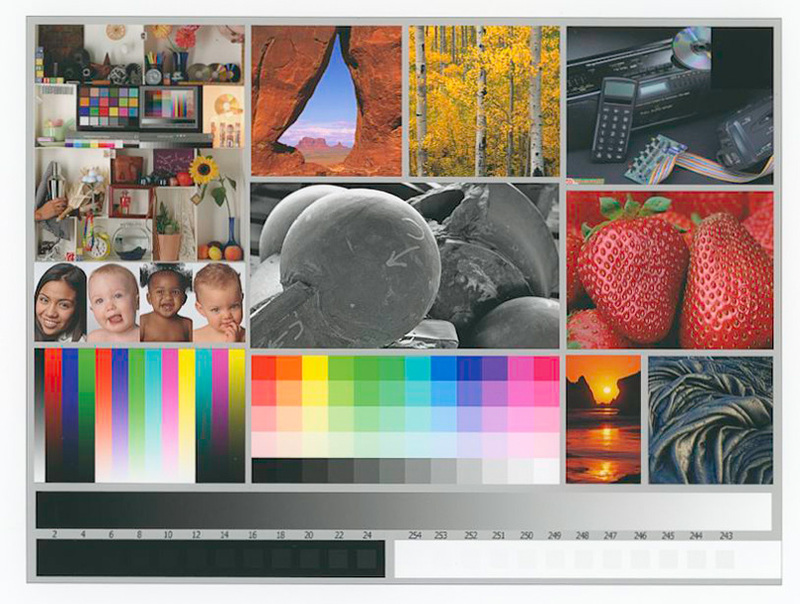 Interestingly, its specified Media Type for its own profiles is Epson Ultra Premium Luster Photo Paper (PLPP). For my custom profiling of this paper in the SCP800, I used Epson Legacy Baryta paper because there is more similarity of the paper white for both papers, being less blue than PLPP. One physical feature I really like about this paper is its flexibility. It is excellent material for feeding into the printers’ sheet feeders, and for those binding their photos into books – as I do, a bookbinder’s delight, insofar as once bound, the pages turn very easily and naturally. 1st column: Short name of paper and a mention of the substrate. 3rd column: Printer identified at top, and the Media Type used for the profile in the print settings underneath. 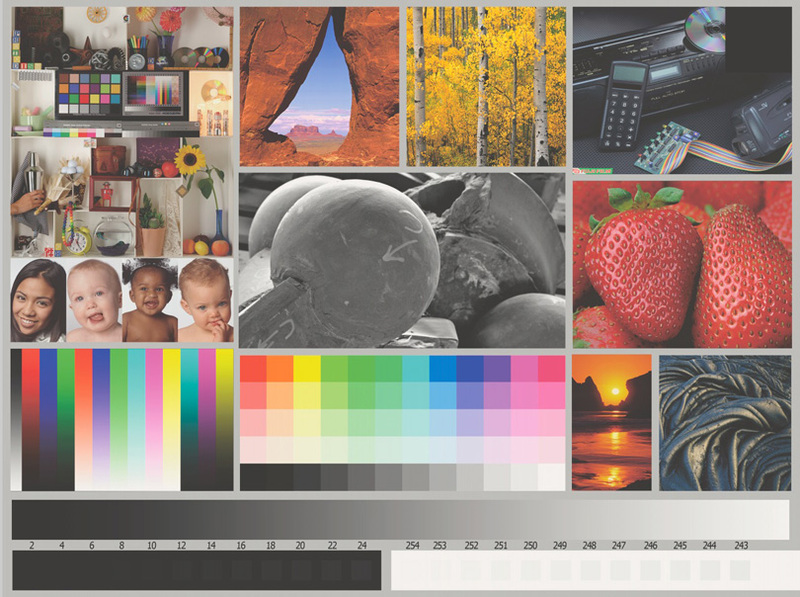 Depending on the printer and the profiling approach, Media Types can vary for the same printer. 5th-8th columns: The gamut limits of the RGB primaries in L*a*b* values read from CTP. This can be useful for understanding some gamut characteristics. 9th column: Profile accuracy measured from my Gretag Macbeth ColorChecker (GMCCTW) evaluation target using i1Pro2, i1Profiler and Excel. 10th and 11th columns: Paper white: column 9 measured in L*, a* and b* from the profile data in CTP and column 10 measured off the paper with my i1Pro2. Whether for the OEM (paper brand) profiles or the custom profiles (“Mark” – i.e. mine), gamut volume is somewhat larger for the Pro-1000 printer than for the P800. I don’t consider the range reported to be very important in terms of perceived printed outcomes, though I would have preferred a higher value for my (“Mark”) profile in the Epson P800. For both printers, custom profiles are more accurate than OEM profiles (see the “Accuracy” column), the custom profiles being very good in this regard. 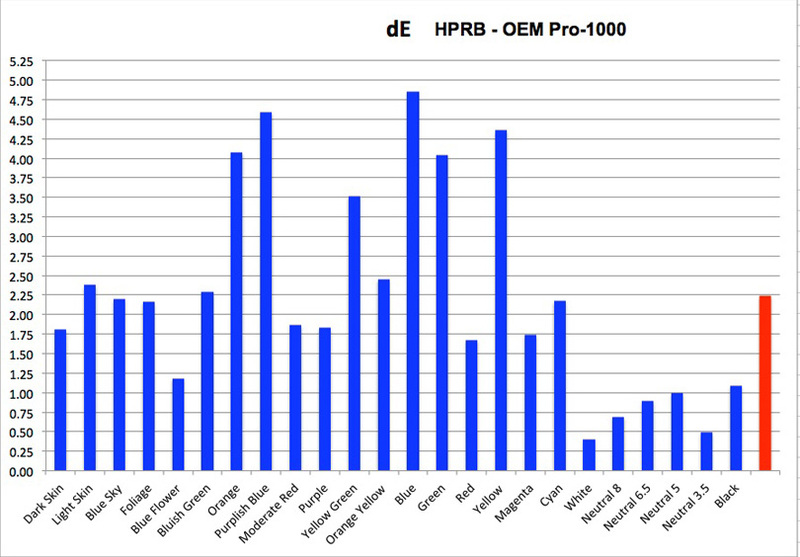 The value of 2.24 for the OEM Pro-1000 profile is somewhat higher than preferred. 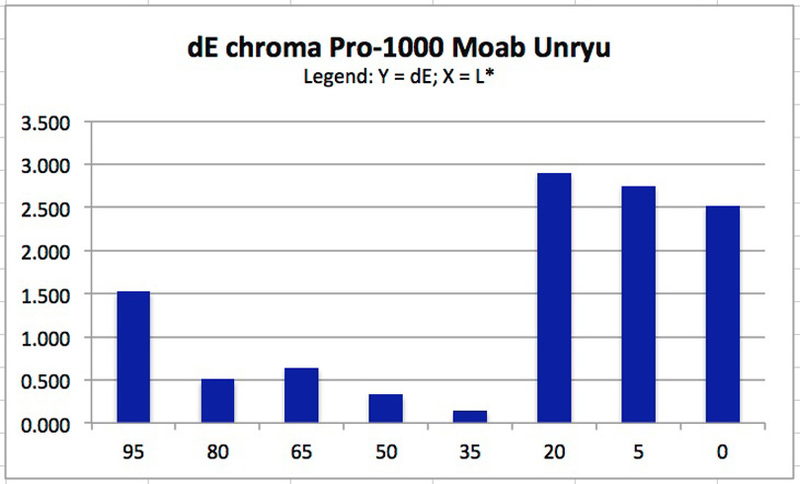 [The “M” designations in brackets beside the Accuracy data show the profiling Measurement Mode in i1Profiler that yielded the lowest dE as between M0, M1 and M2, which deal with the inclusion or exclusion of OBAs in the measurements.] 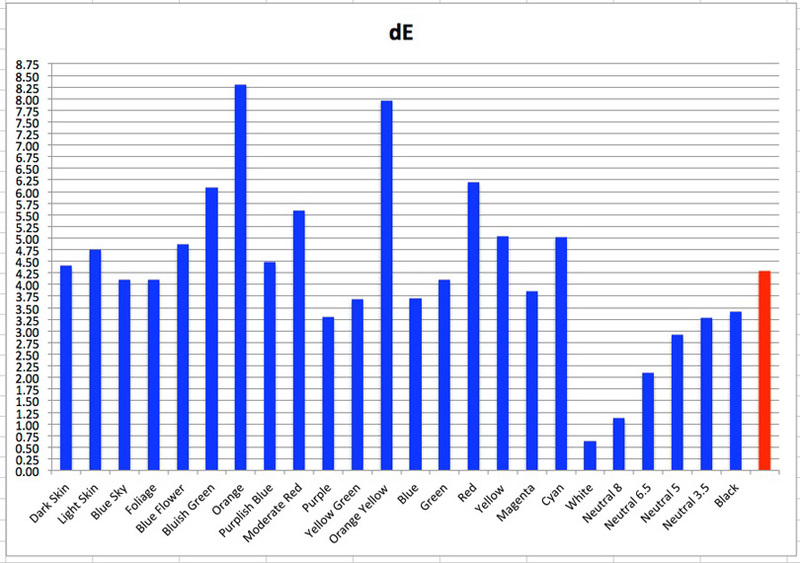 Of equal interest to the average dE outcomes are the dispersions around the average. 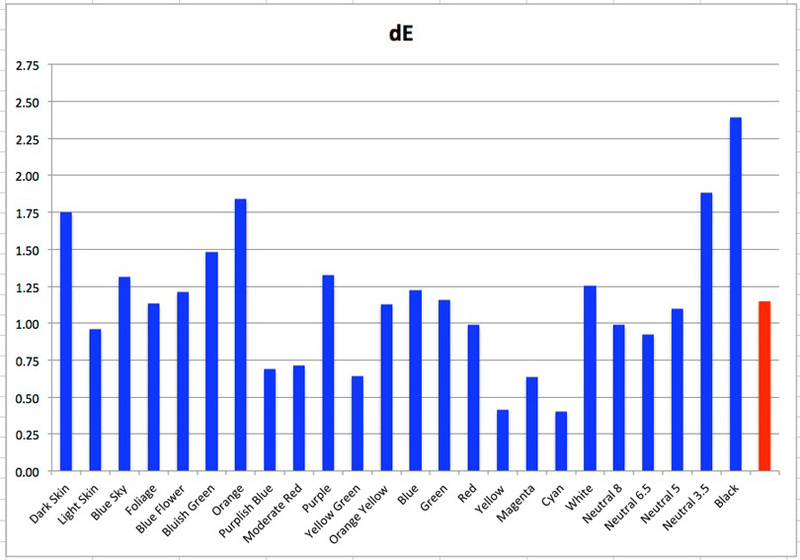 The dispersion graphs in Figures 2, 3, 4 and 5 below show the dE values for the individual tested patches in the GMCCTW evaluation target. For all the papers, the profiling target for the custom profiles is an XRite 2033 patch target. The targets are printed from ACPU for the P800 and Print Studio Pro for the Pro1000 and measured using XRite i1Profiler with an i1Pro2 spectrophotometer. I don’t have information on how most of the OEM profiles were made. The important things to look at in the above graphs are the pattern of the bars and the height of the higher ones relative to the scale at the left side. The ideal pattern would be a rather uniform arrangement of the bars at low dE values. The L*a*b* scale was designed so that differences at 1 dE would start to be just noticeable. 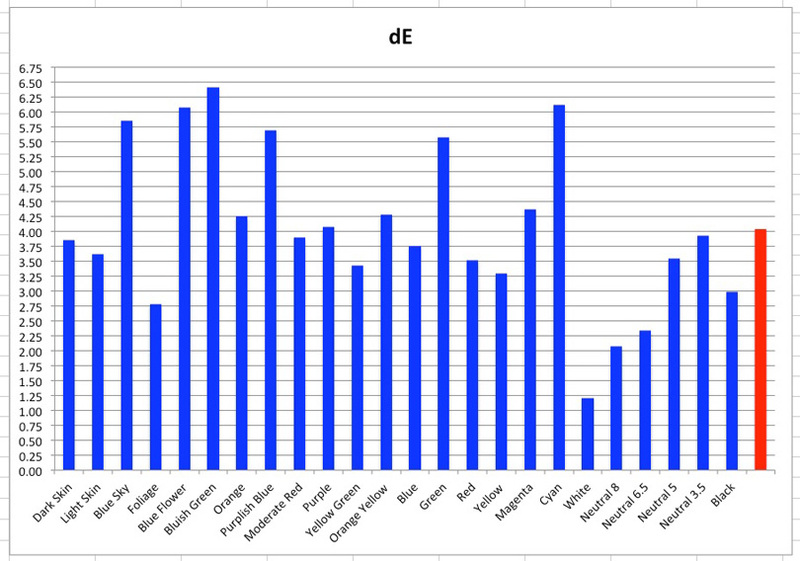 For all purposes where very high accuracy is not important, I have found [through research based on the deliberate printing of all 24 GMCCTW patches having ranges inaccuracy from dE 1 to 4] that for the most part at least up to 2 dE inaccuracy would not be terribly jarring. 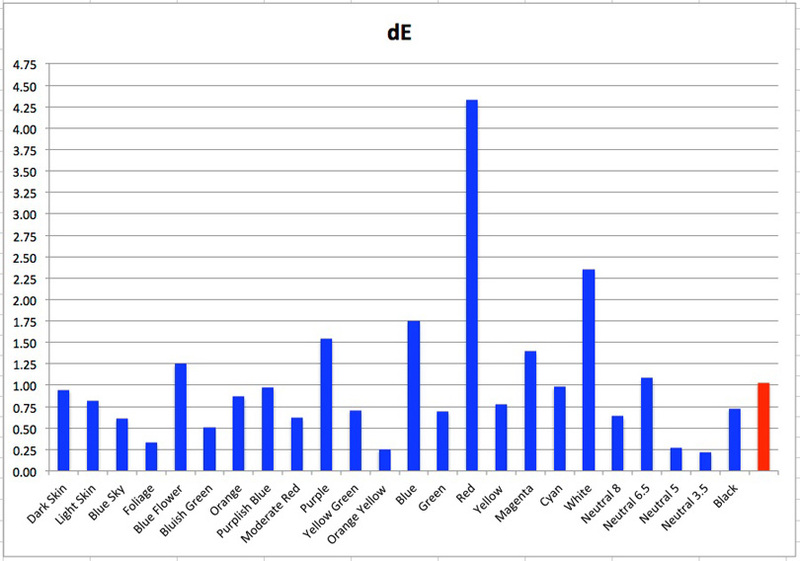 As I mentioned in previous articles on this subject, a small component of the dE is measurement variance caused by minor performance variation of the spectrophotometer (usually within several 10ths or 100ths of 1 dE) and variance of reflectance from different placements on the media where the colour or neutrality is supposed to be the same anywhere on the patch. While Figures 4 and 5 indicate very little concern about any of the colours, I would start being somewhat concerned about the results for Red and Moderate Red in Figure 2 (OEM-P800), and a bit more concerned about seven colours reaching beyond 2.25 in Figure 3 (OEM Pro-1000). Looking at paper white, this is a bright paper (L* just a few notches below 100), and quite neutral – there being only a slight warm bias shown by the low positive b* values for White, and a smaller coolish bias for Black. This is a primary indication that strict neutrality is not consistently preserved across the tonal range (see below). Turning to rendition of Black – read from the paper, (Columns “Min L* Print” in Figure 1), HPRB when printed with the OEM profiles achieves 2.4 and 1.9 in the P800 and Pro1000 respectively, while from the Mark profile the results are 2.5 and 2.1 respectively – quite consistent, with the Pro-1000 producing slightly blacker Maximum Black on this paper. The neutrality of the grayscale is variable. To measure grayscale neutrality, for each paper I read the extended grayscale patches on my GMCCTW evaluation target (Figure 6, circled in red), which proceed from L*100 to L*0. From these readings I calculated the chroma dE(76) for each grayscale patch using the a* + b* channels, any deviation from 0 indicating an off-gray bias (recall, when a*+b*=0, the colour is gray). I then averaged the dE for the 8 patches from L*95 to L*0. I did this exercise only for my custom profiles, as they are on the whole more accurate profiles. The results for this paper are not bad. 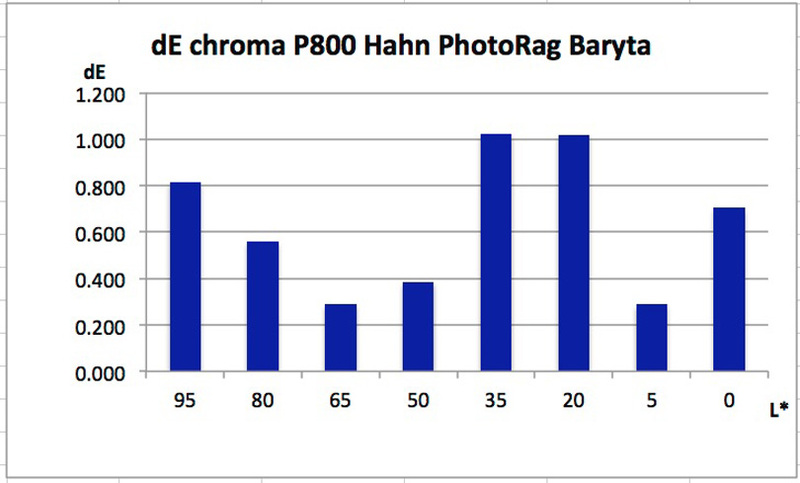 The average dE of the grayscale is 0.64 and 0.60 for the P800 and Pro-1000 printers respectively. 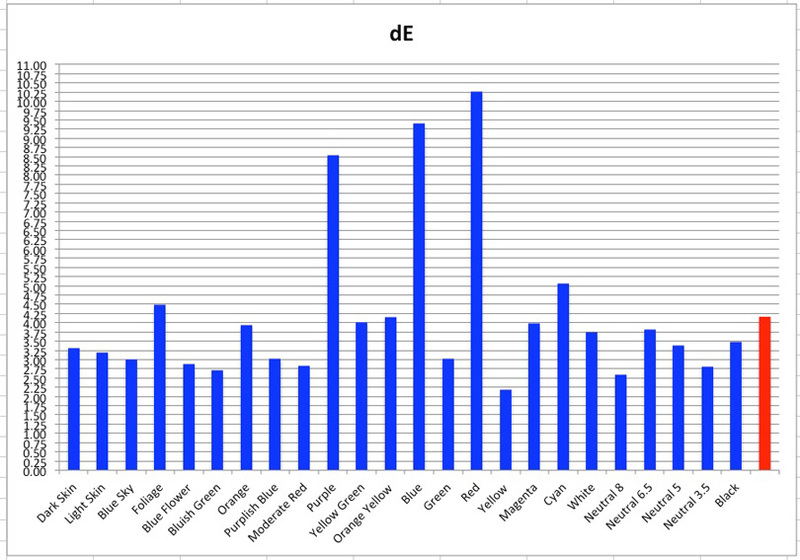 I then graphed the dE outcomes per patch in order to visualize the extent of grayscale constancy from near-white to black for each measured tone interval (Figures 7 and 8). 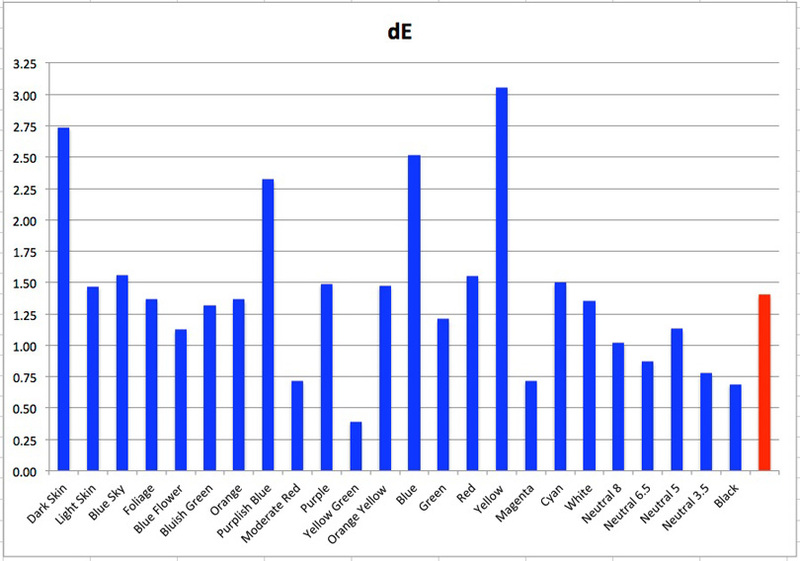 While the range of variation may look bad in those figures, when you see the scale on the left and realize that most of the values lie below or around dE1.0, these results are pretty good – in the sense that they fall below most people’s visual perception of differences from gray. In sum, I like this paper. The finish is a pleasing fine-textured luster, it’s flexible, the cotton substrate feels nice to the touch, paper white is good, no OBAs, Black rendition is fine as well. Gamut and colour saturation from these printers are as expected for this class of paper. Tonal gradations are smooth. 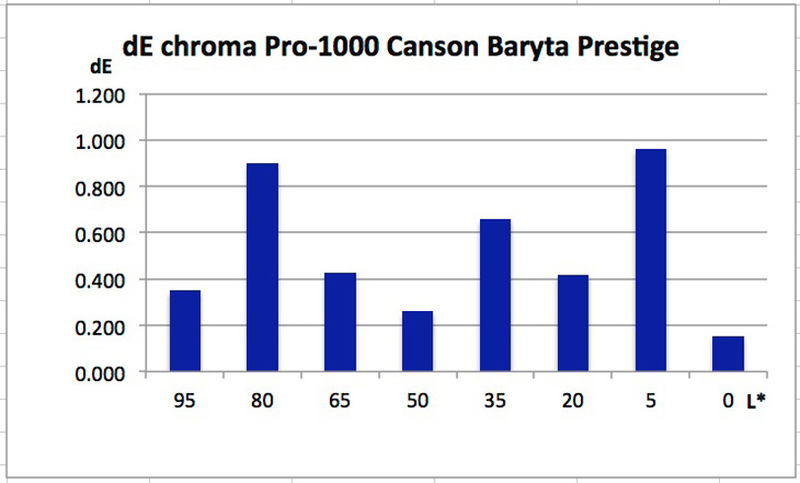 Canson Baryta Prestige (CBP), also within the luster family, is a rather different paper from HPRB even though both use Baryta. This paper has a slightly whiter appearance than HPRB, and is considerably heavier (340 gsm) and stiffer. The paper thickness is about 14.6 mils. The substrate is a mixture of alpha-cellulose and cotton, but feels as if alpha-cellulose is the predominant ingredient. Unlike HPRB which has none, CBP does contain some OBA content (Figure 9), perhaps explaining why it looks brighter. It comes in a range of sheet and roll sizes, indicated on the Canson Infinity website. Like Hahnemuhle does for HPRB, Canson advertises this paper as “smooth gloss”, but also like HPRB it’s a finely textured luster/semi-gloss finish. The stiffness of this paper posed a loading challenge for the P800, but not for the Pro-1000. I was able to feed it through either the top sheet feed or the back manual feed of the Pro-1000 with no difficulty whatsoever. Not so with the P800. It should definitely not be fed through the top sheet feeder – it’s too stiff and heavy. It also turned out to be rather too stiff for the Front Fine Art (FFA) feed. Loading it the normal way from the FFA tray, it invariably struck the bottom of the back paper guide and stayed there, rather than climbing up it. Loading it from back to front through the roll paper feed was also cumbersome because it jammed on the way in when it reached the bend. The solution is to very slightly bend the paper inward at one end and feed that end through the back roller feed mechanism first. The very slight curl allows it to navigate around the bend at the bottom, while you insert your hand as far as it will go into the front of the FFA so as you push the paper from the back with one hand you can fish it out to the FFA front tray guide and align it such that is doesn’t return a skew error after pressing “Load”. This media cannot be used in the poster board feed because the correct Media Type selections don’t offer it in the Epson driver. Verdict on the P800 feed for this paper: awkward, but with a slight bend of the paper and nimble fingers it’s usable. For the P800 custom profile I used Legacy Baryta as the Media Type, because CBP is thicker and less blue than Epson Premium Luster, hence closer to Legacy Baryta than to Premium Luster. The variance of gamut volumes is not terribly significant, all of them being within the expected range for this class of paper and printers. I achieved the highest gamut volume for this paper with the custom profile for the Pro-1000 printer. Likewise, the OEM profile for the Pro-1000 has slightly higher gamut volume than that shown for the SCP800. 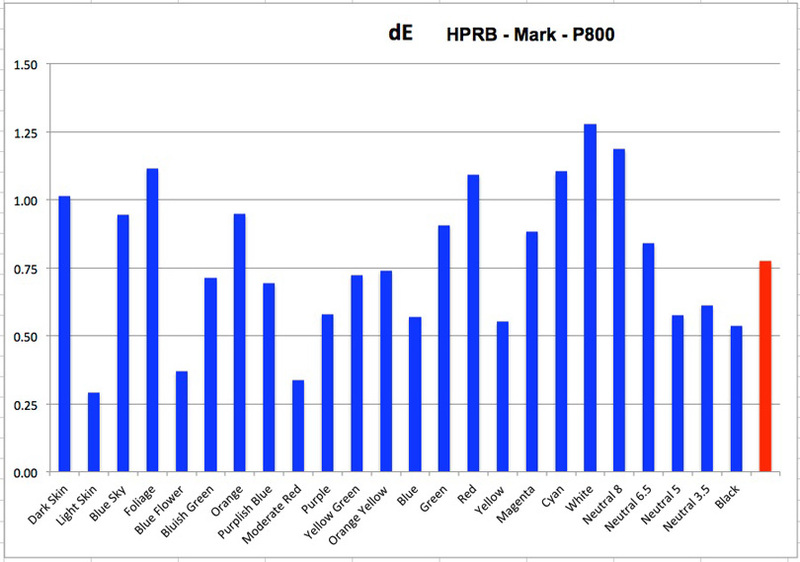 On the whole, these gamut volumes slightly exceed those for HPRB seen in Figure 1. For both the SCP800 and Pro-1000, the OEM profiles show dE readings in the range of 4, exceeding the range I would consider acceptable; however the custom (“Mark”) profiles are OK, the one for the Pro-1000 showing greater accuracy than that for the SCP800. The accuracy readings by patch colour are shown below. In all these graphs, the red bar is the average. “Black” in reality is L*20 gray in the GMCC Reference file. In reading these graphs it’s important to be mindful of the scale on the left side. 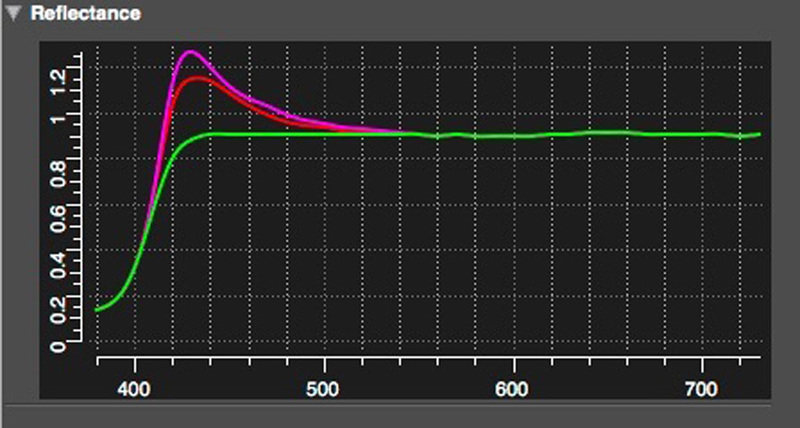 The range is much lower for the Mark Profiles than for the OEM profiles, because the Mark profiles are more accurate and therefore have lower maximum dE values per colour. 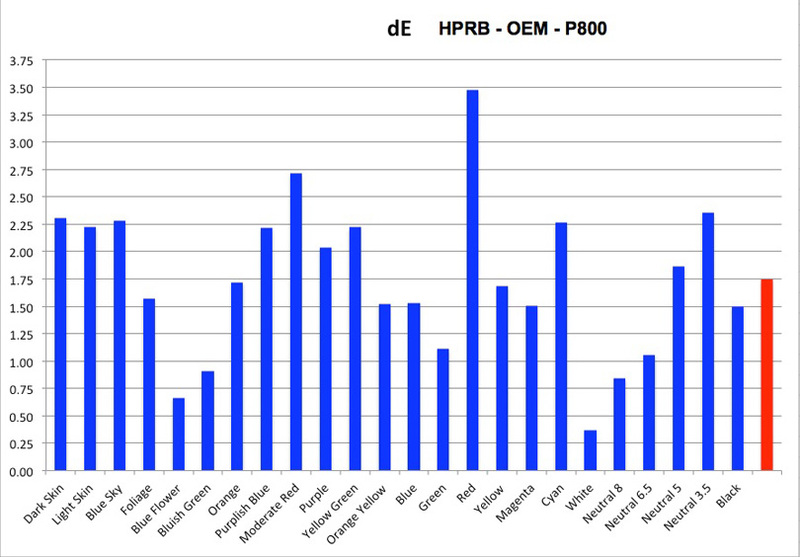 For example, the highest dE for the OEM profiles is 8.25 (Orange, Pro1000), while the highest for the Mark profiles is a bit above 3.0 (Yellow, SCP800). In particular, the performance of the neutrals for the OEM profiles shows rather higher dE values than one would have preferred. For the Mark profiles, neutrals dE performance is on the whole very good. Looking at White and Black points, this is quite a bright paper, maximum brightness being in the range of L*97~98. Maximum Black (minimum L*) is good, being within a range of 1.7 to 2.1 for both printers and profile sources. White and Black point neutrality is also quite good, but best for the Mark Profile in the Pro-1000. Perhaps this is because I derived the greatest overall accuracy using the M0 mode (i1Profiler) for my profile in this printer, whereas for the OEM profile in both printers and my profile in the P800 overall accuracy was best in the M2 mode, but a slight yellow bias in the range of L*2 turned up in the Black point reading. Turning to Grayscale neutrality for the Mark profiles for the two printers, the average dE of the a*+b* channels for the SCP800 and Pro1000 are 1.1 and 0.5 respectively. Grayscale neutrality across the tonal range (Figures 15 and 16, and again please note the left-side scale difference between the two), is better preserved for the Pro1000 than for the SCP800, though both sets of results are visually acceptable for most general photographic purposes. The value of 2.0 at the L*50 point for the SCP800 is quite an outlier, and on careful verification with repeated readings, not a measurement error. I don’t have an explanation for it. Wrapping up, both of these papers (HPRB and CBP) make fine-looking prints from both printers. 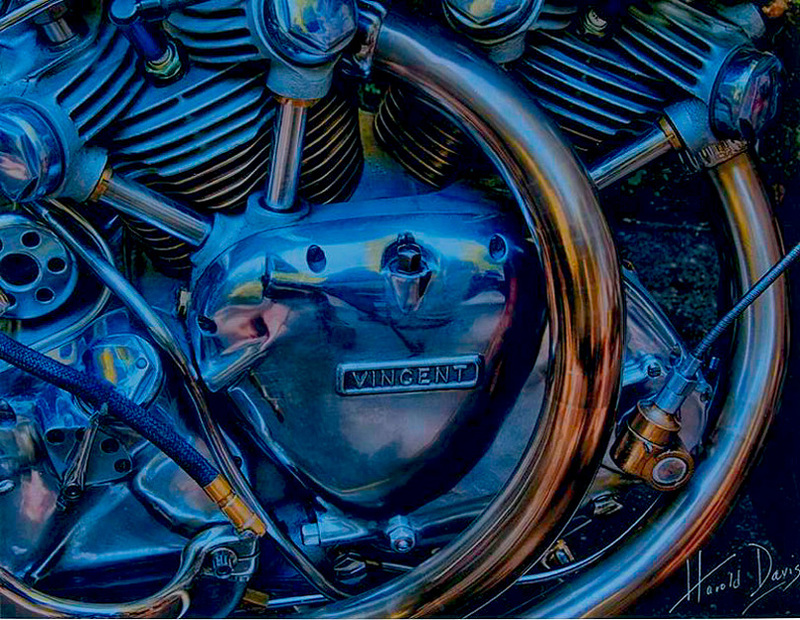 Smoothness of tonal gradations is fine, colour saturation and detail rendition are also fine. Whether you use one of these or several other Baryta papers in their class depends on your taste for the differences of heft, feel, substrate, surface texture and price. Having analyzed and evaluated these two rather conventional offerings, the remainder of this review focuses on the “unconventional”, some of which is not amenable to the kind of analysis done above for reasons that will become apparent. BCA is a stiff aluminium sheet combining the aluminium substrate with a printable white matte coating; hence there is no need to laminate the photo onto the substrate. It comes in a range of sheet sizes from 9×13 inches to 4 x 8 feet, thickness 0.045 inches – and no – not in rolls! ☺. Being stiff metal sheets, they only work in printers having a straight-through feed path – no bends. This eliminates the Canon Pro-1000; however they are compatible with the Epson SCP800 because this printer has a poster-board path and driver setting. Breathing Color provides optional accessories including ready-to-hang wood frames and quartz laminate film – a clear polyester (PET) with a solvent acrylic pressure sensitive adhesive (PSA). 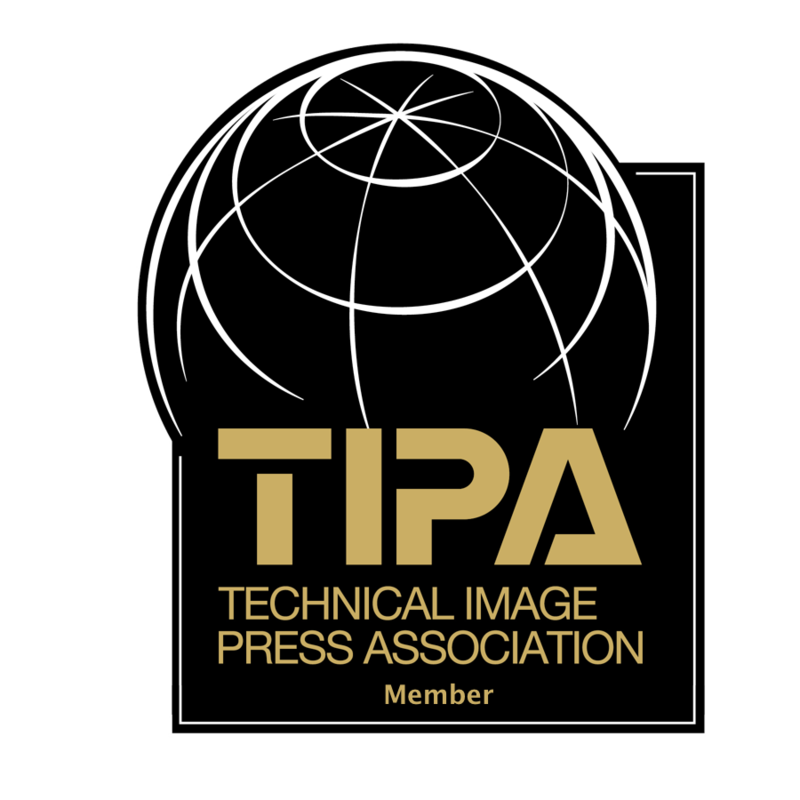 The PET protects the prints from the elements and provides added depth to the printed image, but it requires an expensive press to be applied. Even without the PET, the printed photos look good – rather similar to what’s printed on Epson’s Ultra Premium Presentation Matte paper (UPPM, a.k.a Enhanced Matte); and like UPPM, it’s choc-a-bloc with OBA content (Figure 17). As such, its archival properties are not known. 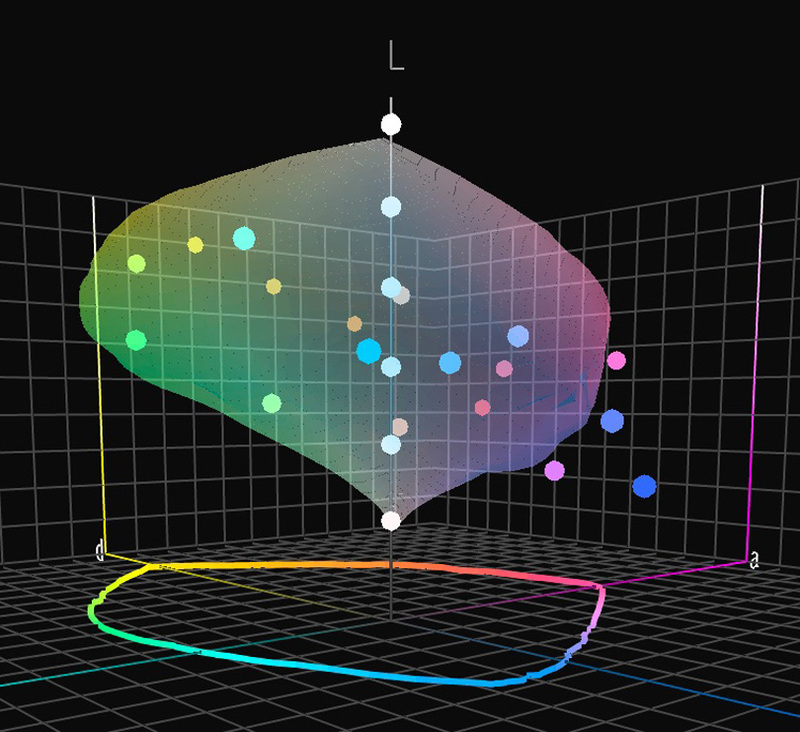 Breathing Color does provide profiles for it, using UPPM as the Media Type. Hence I used the same Media Type for making my custom profile. 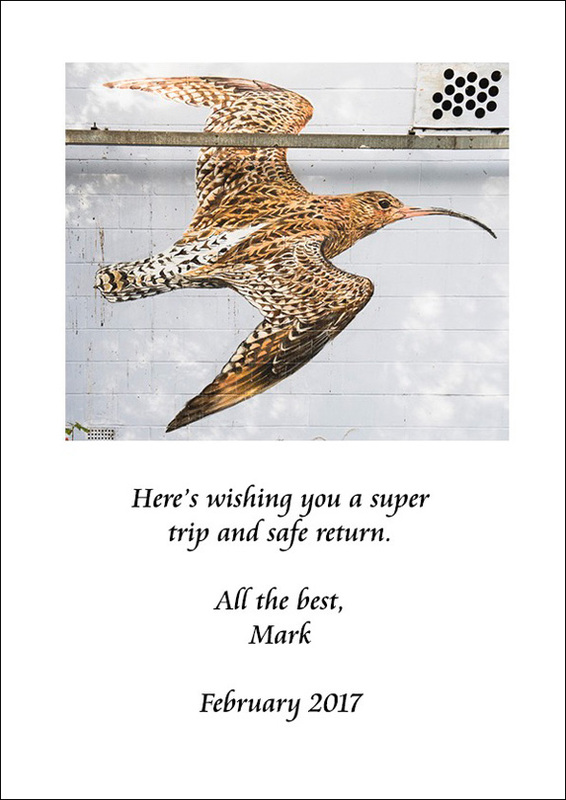 This is the first time an easy to use, convenient direct print-on-metal medium has been offered to the desktop inkjet community without the need for expensive mounting presses or mounting services to print on metal. So it’s a rather unique product. Breathing Color has just announced a new full-bleed carrier that will allow for borderless printing without needing to cut the aluminium sheet. The gamut volume is in the lower range compared with more usual matte papers (Figure 18), it being lower for my profile than for the OEM profile. 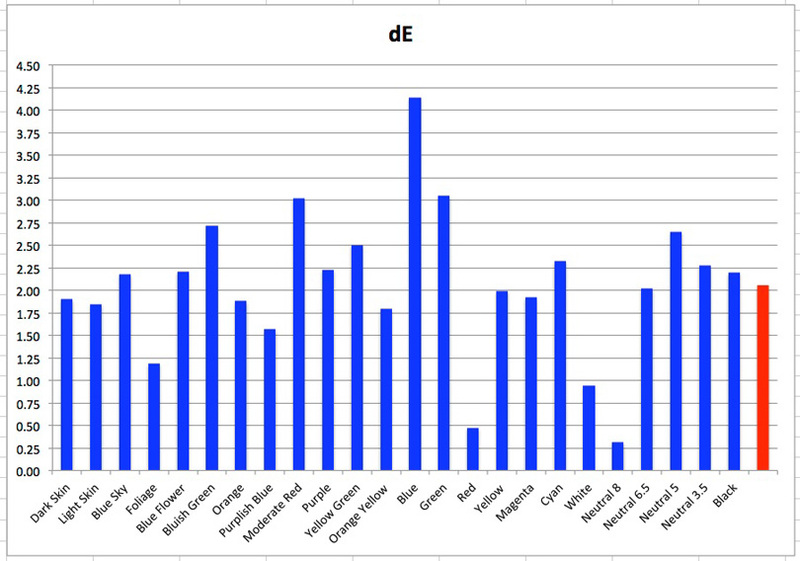 However, my profile is twice as accurate (dE 2.0 vs 1.09 – Figures 18, 19 and 20). Again, please note the scale difference on the left side. For both profiles, Blue is the largest outlier, but at less than half the error in the Mark profile versus the OEM profile. Turning to the White and Black points and the grayscale, this is also a quite bright material, at L* 96+. The readings indicate quite good neutrality at the White and Black points, though the material does look rather bluish seen side-by-side with HPRB, which tends to look a bit warm by comparison (Figure 21). My profile tends to produce a slightly blacker Black point, at L* 18.5, compared with 19.7 for the OEM profile. Grayscale neutrality is good, averaging dE=0.57; (details: Figure 22 – relevant down to just below the L*20), the variance being relatively uniform and considerably less than 1 dE throughout the relevant range. These panels are enjoyable to work with – the SCP800 poster-board feed manages them easily (for the two sizes I tested – 9 x 13 and 12 x 15 inch) and the metal panels are an attractive way of displaying photographs on your walls, once you mount them appropriately. One thing you really need to be mindful off is to tear off the protective plastic sheeting from the matte surface before printing. They don’t tell you about this in the instructions! Ugh. Key thing, however: the prints on these panels look good. Colours are rich and tonal gradations normal. From the “hard-nosed” realm of conventional PK Baryta and aluminium panels, we now enter the “spiritual” world of Bamboo. 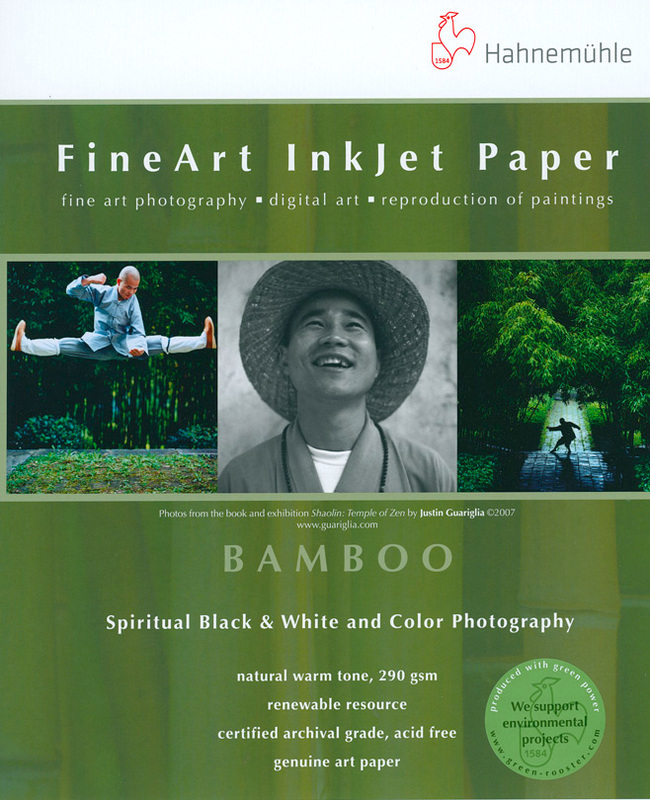 Hahnemuhle describes this 290 gsm, 19.7 mil paper as a natural warmtone paper with a smooth surface texture, made from 90% bamboo fibers and 10% cotton and guarantees archival standards, being OBA and acid free. It has a “premium matt” inkjet coating. It is supplied in a range of sheet and roll sizes listed on the Hahnemuhle website. So why bamboo? A bit of research reveals its claimed advantages: soft, strong, biodegradable (good for prints we don’t intend to keep), rapidly renewable and sustainable, resilient to rust and insects (less pesticide use), efficient absorber of carbon dioxide and producer of Oxygen, requires much less water than trees, virgin fibers (no heavy bleaching), saves trees, and reduces soil erosion. So based on this feature list, bamboo prints should be durable and contribute to environmental sustainability. Bamboo is converted to paper by pulping and beating, as for other papers. Hahnemuhle is remiss at telling us which side is print side up. It’s not too hard to detect this however – the more fuzzy side is the substrate. I wish they would just stick a label on the inner plastic envelope saying “print side up” – it would be so easy, for avoidance of all doubt. But that’s just a quibble, not a deal-breaker. 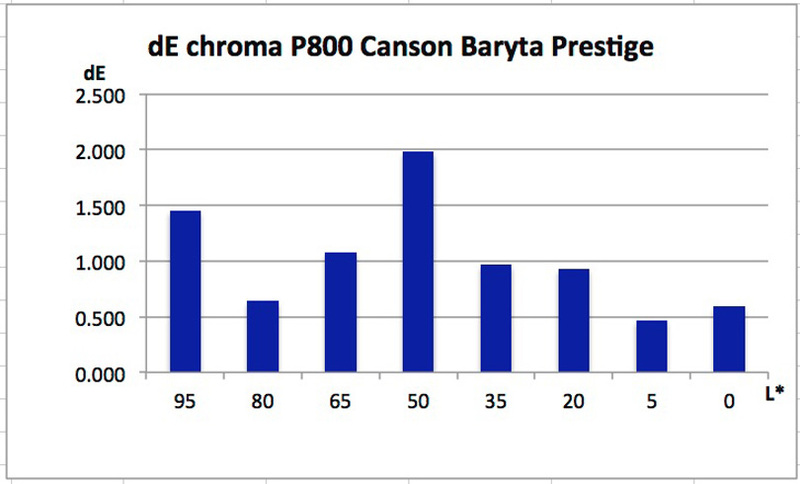 The gamut volume for both printers and profile sources sits within a range of 461K to 501K (Figure 24), the widest gamuts being with the OEM profile in the SCP800 and by a shade less, the Mark profile in the Pro-1000. 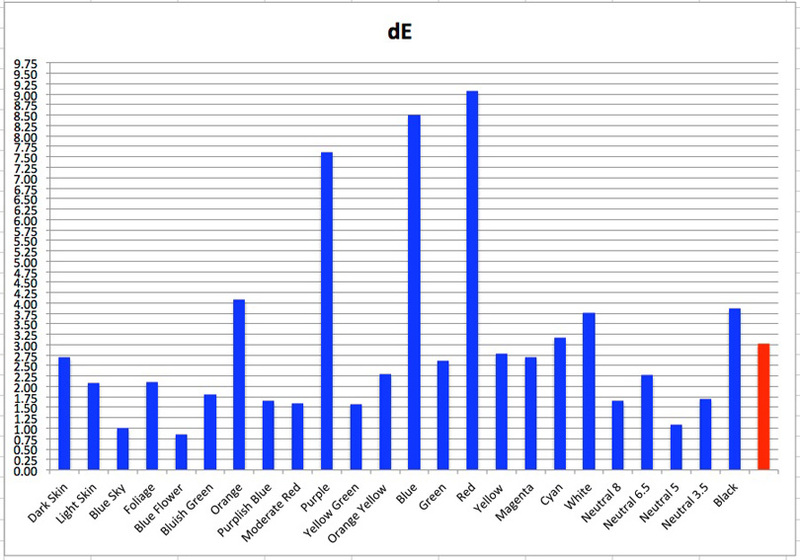 While the accuracy of the OEM profiles is not too bad (in the range of dE 2), the Mark (custom) profiles show about half the average error of the OEM profiles (in the range of dE 1). 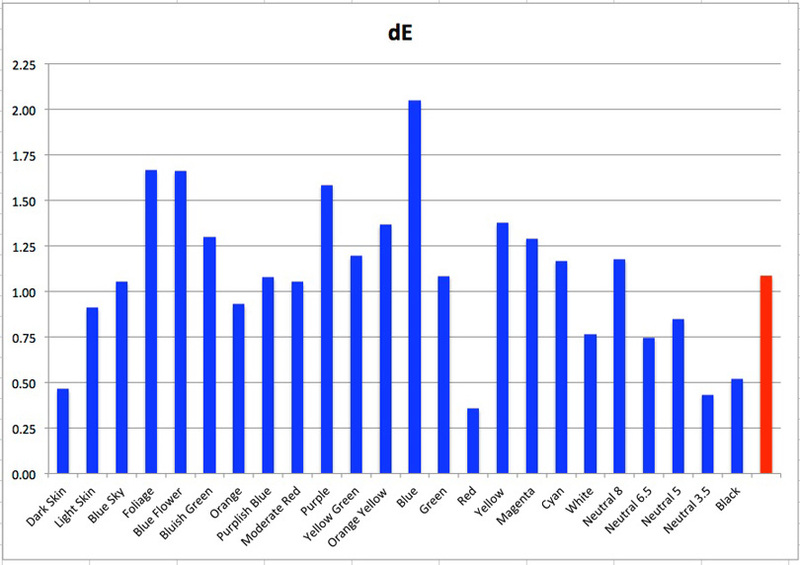 Figures 25~28 show the dE dispersion by colour. Again, for the comparative view of overall error levels, note the difference of the left side scale between these Figures. 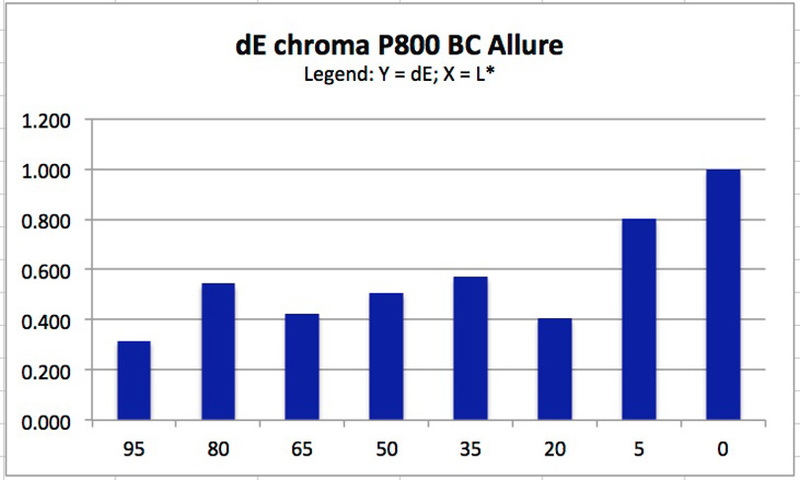 Mysteries of profiling: in Figure 25 (P800, OEM) the biggest outlier is Blue, while in Figure 26 (P800, Mark) it is Red. 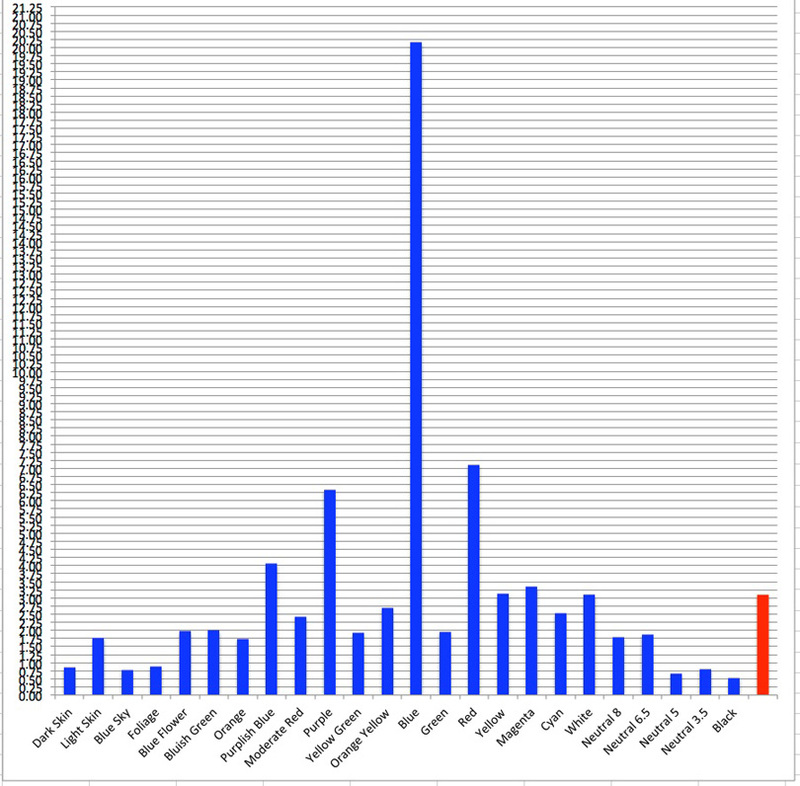 Also note the considerable difference of the bar heights (relative importance of errors by colour) between Figures 27 (Pro1000 OEM) and Figure 28 (Pro1000 Mark). Don’t ask me why. Turning to the grayscale, paper white (as read) is quite bright at about L*96. White point neutrality is very good (close to 0) on the a* axis, but shows a distinct yellowish bias on the b* axis – ranging from about 3 to 7.5 depending on the profile/printer. This is unsurprising considering it is designed as a warm-tone paper, giving it a rather special character suitable for those photos where strict neutrality is either unimportant or even artistically sub-optimal. 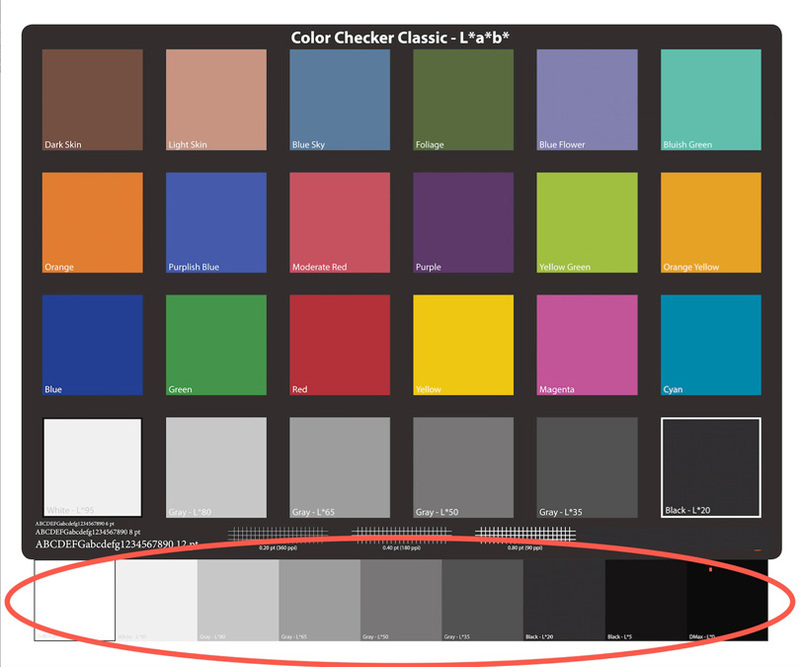 Maximum Black is in the range of L* 16.4 to 18.3 depending on the printer/profile, which is normal for matte papers. Departure from strict neutrality in the Maximum Black point is slightly higher in the a* axis and considerably lower in the b* axis compared with the White point. Grayscale neutrality across the relevant range is shown in Figures 29 and 30. 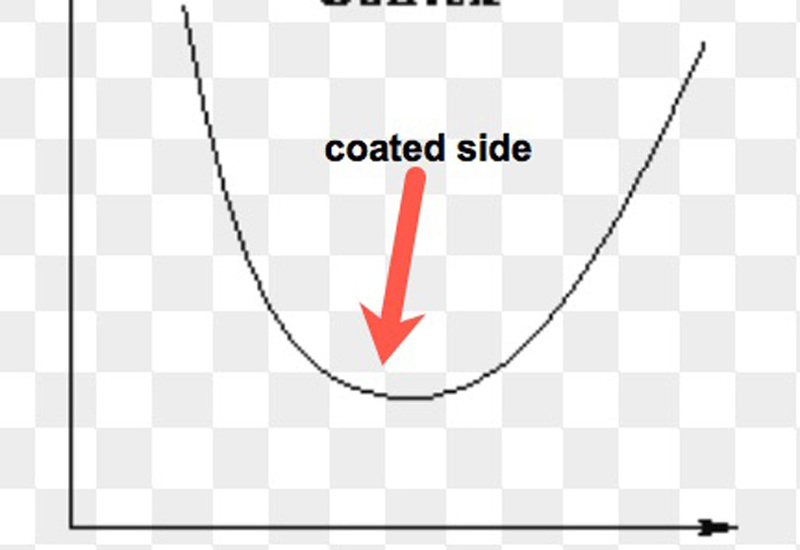 While the shape of these curves may look worrisome at first glance, it needs to be emphasized that most of this variation over the most important part of the scale happens within a range of about 1 to 1.5 dE, so visually it will not be very noticeable or important for general photographic purposes. Turning to the most important matter – how the photos look printed on this paper, I printed the Outback printer evaluation target (Figure 31), and a segment of gritty street art whose colours and subject matter I thought particularly well-suited to this paper (Figure 32). Figure 31 is a scan of the letter-size printed Outback target done with SilverFast Ai 8 Studio in my Epson V850 scanner; it shows a quite reliable portrayal of what the actual print looks like. The overall colour saturation and memory colour retention are both good, the redness of the strawberries being of course a bit more muted than they would be on a luster paper, but nonetheless good for a matte paper. The grayscale tonal ramp is smooth, shadow detail is good, distinction between shades of blackness becoming apparent from RGB Levels 6~8 upward. Mark Profiles for scanning and printing. Hahn Bamboo, Canon Pro1000, Mark Profile. In case you’re interested in the source of this photograph, last November I spent 11 days in London and Bristol photographing street art. 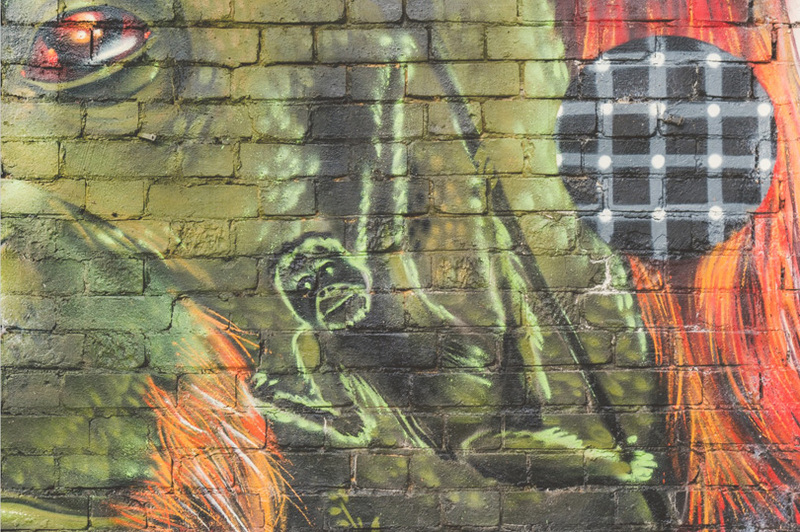 This one is a detail from a large-scale mural, part of Louis Masai’s “Endangered 13” Project painted on the walls within the railway viaduct arches at Ackroyd Drive Greenlink and Bow Common Lane in London. (You get there by walking South a few blocks from Mile End Tube Station.) This project is a very remarkable statement about the importance of environmental and species preservation, and for all we know, the monkey may be swinging on a bamboo pole; so for this reason, and the predominant colours, I thought it particularly fitting for the paper at hand. The print is actually richer than suggested by its appearance in Figure 32. The glow of the bright green is particularly engaging. As this is a 25MB raw file (shot with my Sony a6300 and Zeiss lens) it has ample sharpness and resolution for a very high quality 13×19 or even 17×22 inch print, so I’m tempted to buy some larger size stock of this paper and give it a try. There are many more such photos that could benefit from the same treatment. 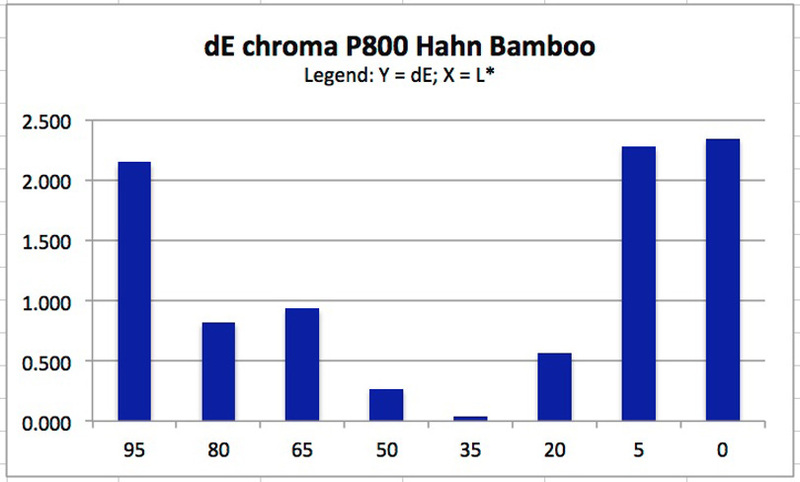 Summary word on Hahnemuhle Bamboo: nice paper. We travel into the yet more exotic world of machine-made Japanese Washi. This paper and the next one on my list – Moenkopi Unryu – are manufactured in the Awagami Factory, Tokushima Japan. Apart from Legion Paper’s marketing under the Moab label, they are also marketed as AIJP (Awagami Inkjet Paper) and broadly retailed as such. There are some differences of specs between the Moab and AIJP versions of Kozo: the Moab presentation is 110 gsm (18 mil/0.46mm), while the AIJP versions come in weights of 70 gsm (0.16mm) or 110 gsm (0.23mm). Frankly, it doesn’t really display colours all that accurately as we shall see below, but for these papers that is hardly important; what matters more is the effect and the feel, and one should use it with that in mind. If you’re looking for great accuracy, I suggest you use conventional PK luster or gloss paper. These papers are acid free, pH neutral and contain no OBAs. Kozo, as the name implies, is made from mulberry fibers, which the Factory says are long, thick, soft and durable. It is especially coated to mitigate bleed that is common with Kozo-type papers. Kozo comes in a variety of sheet and roll sizes as shown on the suppliers’ websites. Letter size is A4 rather than US Letter, so best make a custom preset. As for some other papers, they say the printing side is the one facing the front of the packaging. But they don’t tell you what side of the packaging is front and it’s not obvious. Again, a “print side up” label would be really helpful. Unryu has a bit of a natural curl, and the coated side is the one curling inward (Figure 33). For Kozo, the slightly more textured side is printable. This papers’ gamut volume is quite a bit narrower than that of conventional “Western” matte papers, being in the lower part of the 300K range, rather than the upper-400s to lower 500s. 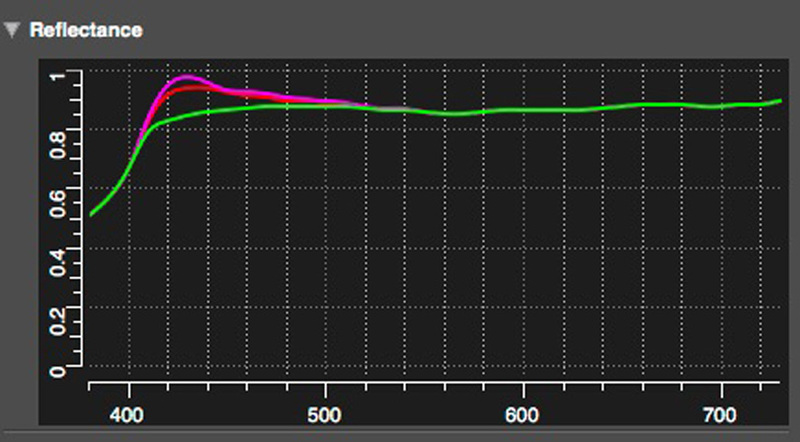 This affects profiling accuracy, which is not that great for either the OEM or Mark (custom) profiles (Figure 34), the custom being somewhat more accurate, but still beyond my normally acceptable dE range. 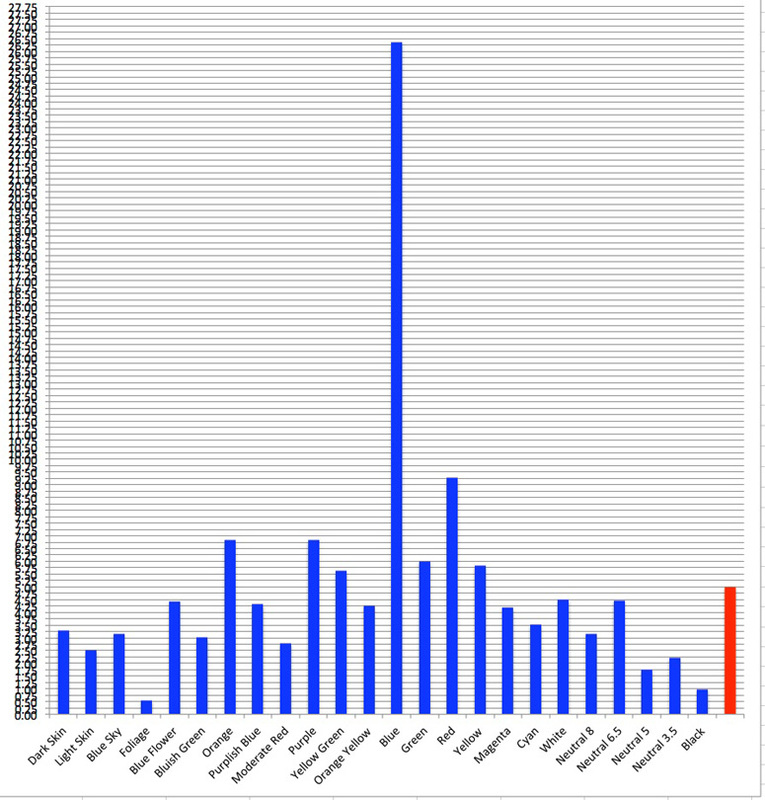 Before showing the bar-graph dE values for the GMCCTW patches, it is insightful to ponder the source of the inaccuracy. I believe there are two factors at play: (1) the papers’ own variation of tone/hue and texture and (2) the printed gamut for some of the colours is narrower than the reference file values for those colours in the accuracy test target. This latter factor is illustrated in Figures 35 and 36, where the “cloud” is the printer/paper gamut (profile measurement in CTP), and the coloured balls graph the reference file values of the patches in the GMCCTW target. While these figures are for the Unryu paper, a similar phenomenon occurs for Kozo. Notice how some of the balls (file reference values) fall outside of the cloud (printer/paper gamut). If the printer/paper combination doesn’t incorporate some reference values, the printed patches will not measure coherently with those values. 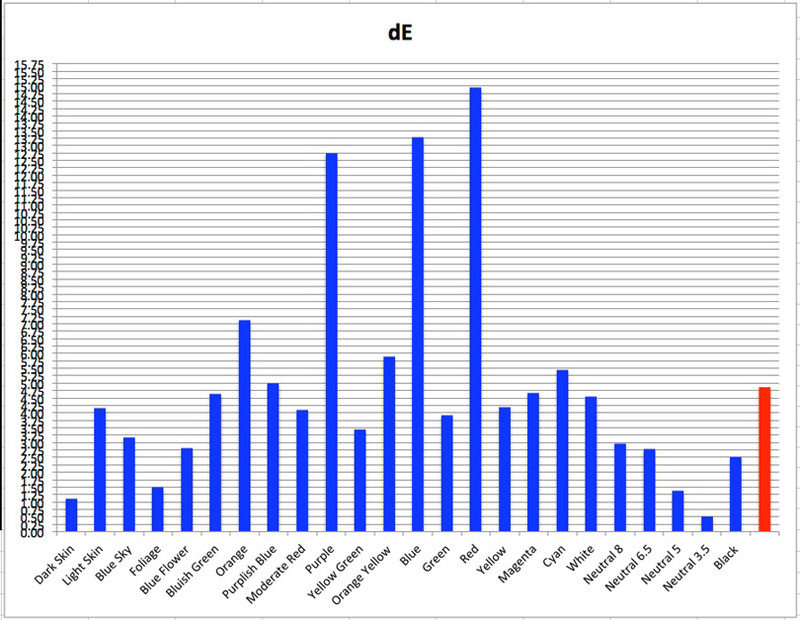 The average dE of the OEM profiles is remarkably close for the two printers, but the shapes of the inaccuracies (i.e. dE by colour) differ considerably. Again, please be mindful of the scale differences between Figures 37 and 38. 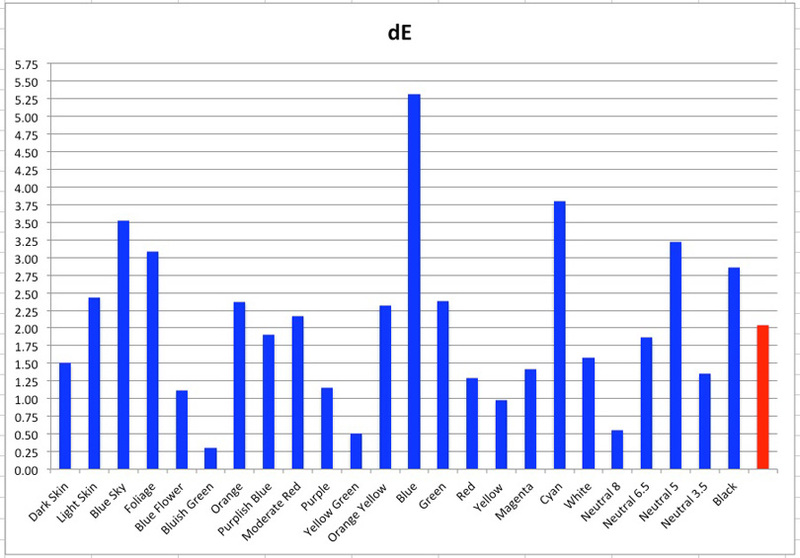 On the whole, for all four cases, Blue, Red and Purple are the most outlying colours in terms of dE variance from either their reference values or the average dE of the chart. 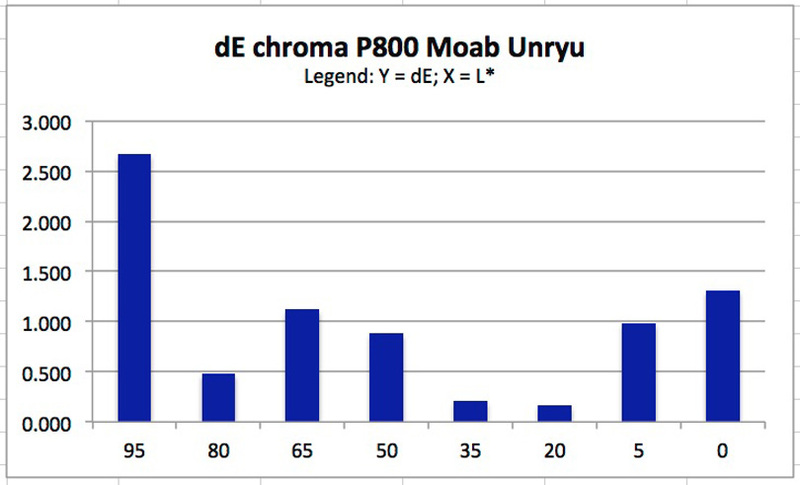 In both the custom and OEM profiles, the dE of Blue is particularly egregious for the P800, while to a lesser extent the same can be said for Red in the Pro1000. Notice in Figures 35 and 36 how the reddish and bluish balls are the ones most outside of paper/printer gamut. Turning to the White point, Maximum Black and the Grayscale, the read values from the brightest patch varied between 92.6 and 96.5 depending on the profile. The b* channel exhibits a warm (yellowish) bias as expected for this paper. The Minimum Black is blacker and more neutral from the P800 than from the Pro1000 in both the OEM and custom profiles. 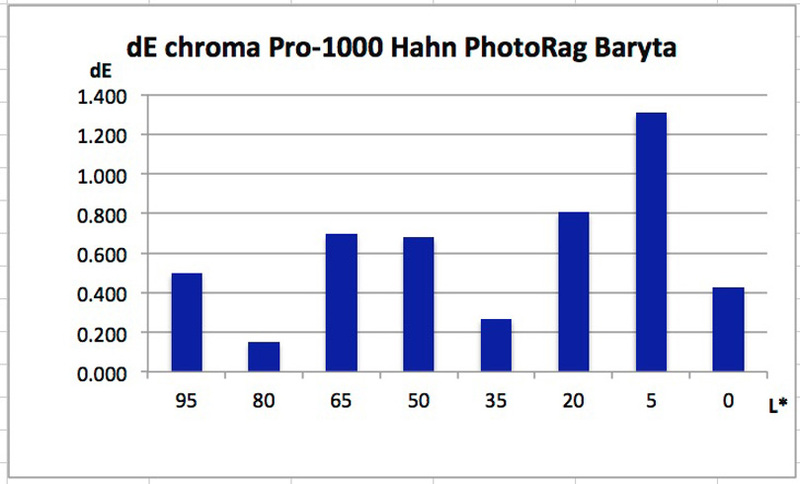 The average dE of the a*b* channels for the grayscale is 1.35 for the P800 and 1.96 for the Pro1000. 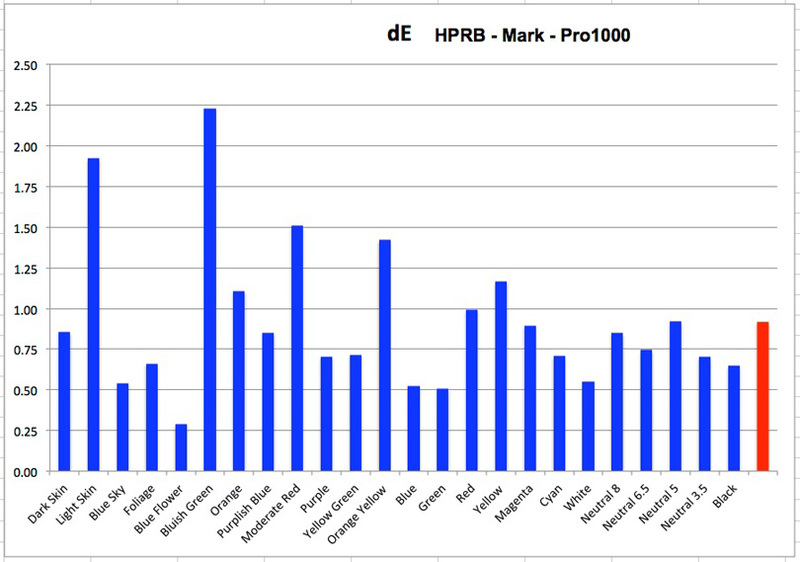 The shape and size of the deviations for the Pro1000 are particularly pronounced. 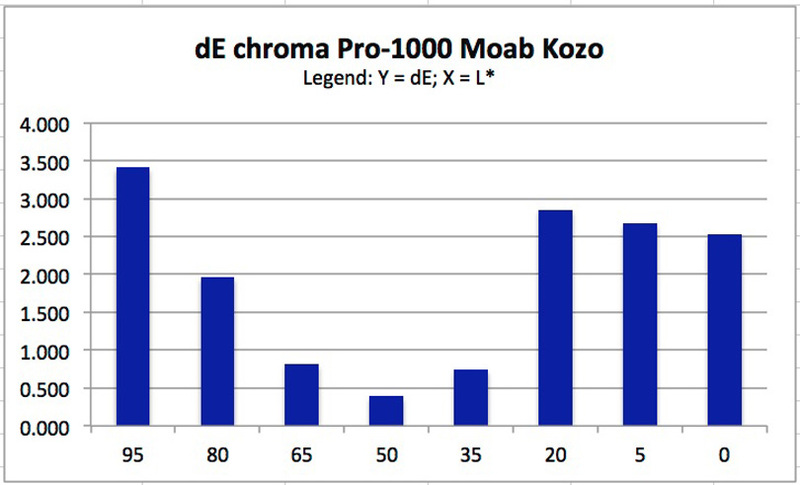 For warm-tone papers one would expect that as ink density increases the dE would decrease, but as the patches get darker from middle gray downward, to a differing extent the opposite is happening, particularly in the case of the Pro1000. I don’t have an explanation. 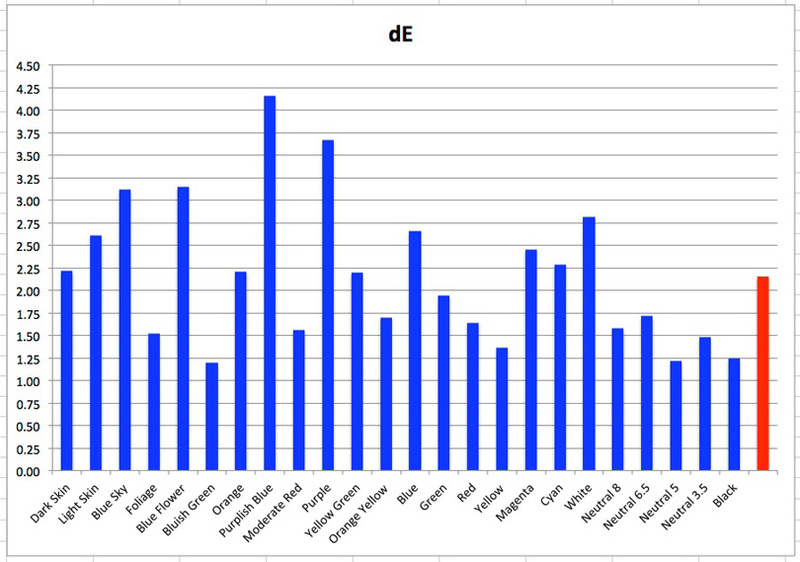 As this paper has no OBA content the choice of M condition should make little difference, and I always use the one showing the least overall average dE for the test as a whole. Finally, after all is said and done, what kind of photos should one print on this paper and what do the prints look like? It’s best to print photos on this paper that don’t need particularly wide gamut or “by the numbers” very dense Black. That said, the Black rendition looks somewhat better on paper than the numbers would suggest. 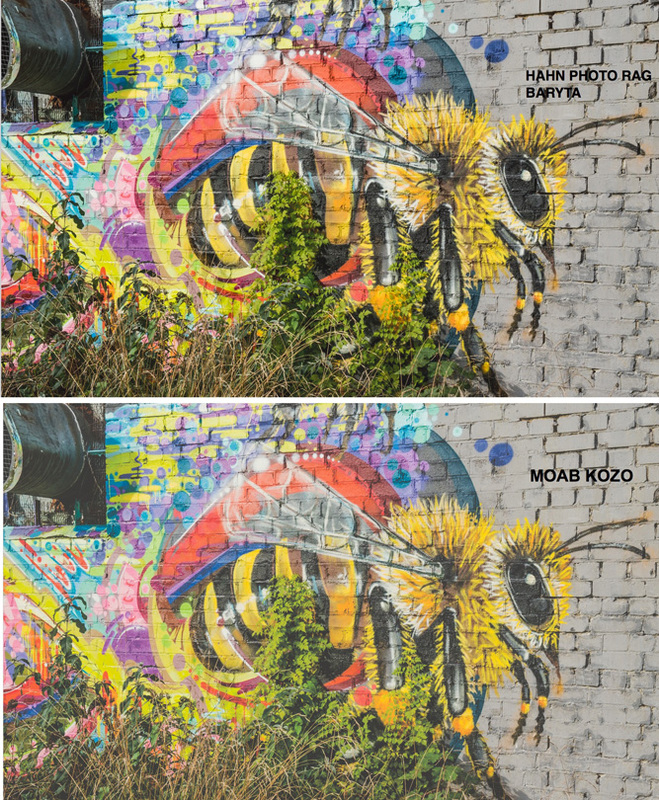 Figure 43 is a comparison showing the same photo (a Louis Masai “Bee” at the Endangered 13 project) edited under soft-proof in one rendition for HPRB (PK) and in another for Kozo (MK). Clearly, this photo has the kind of quite saturated colour palette that looks better on PK rather than on an MK paper of much less gamut. 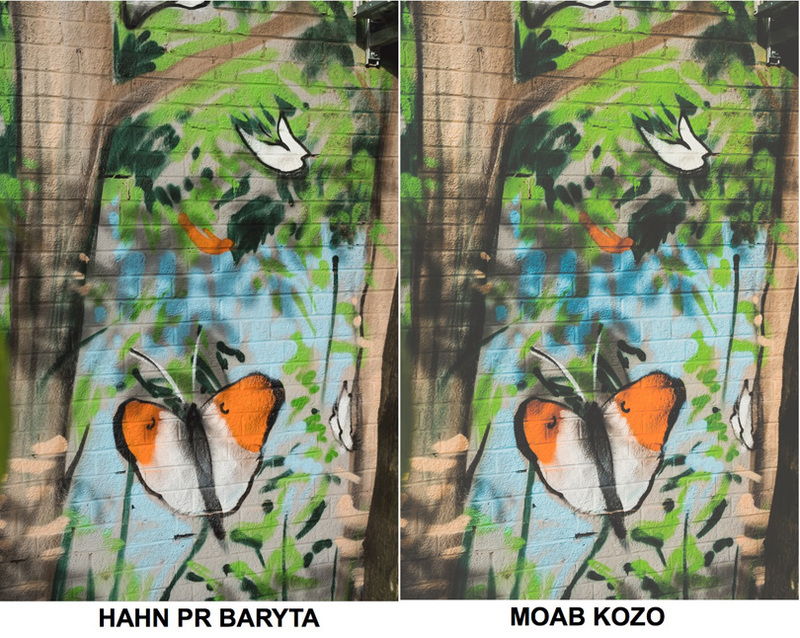 However, take a photo where the demands on colour saturation are not nearly so great and the Kozo rendition looks not very different from that achievable with a wide gamut paper such as HPRB (Figure 44). The illustrations are screen-grabs of the softproof versions as seen in Lightroom using the printer profiles appropriate to the printer/paper combination, in this case Canon Pro1000 with either HPRB or MKK papers. The softproofs resemble the printed output quite closely, as they should. (I’m using the Pro1000 for comparison work requiring alternate use of PK or MK ink, so that I do not incur the wastage of time and ink required for Black ink switching in the SCP800.) 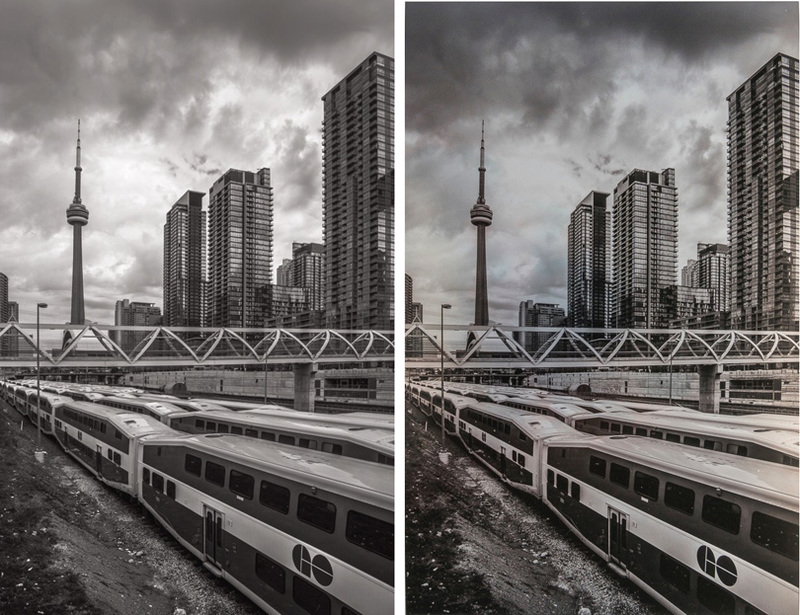 I adjusted each photo to give them the most appropriate tone and hue appearance that I could for the printer/paper combination of each. The adjustments differ in each case. 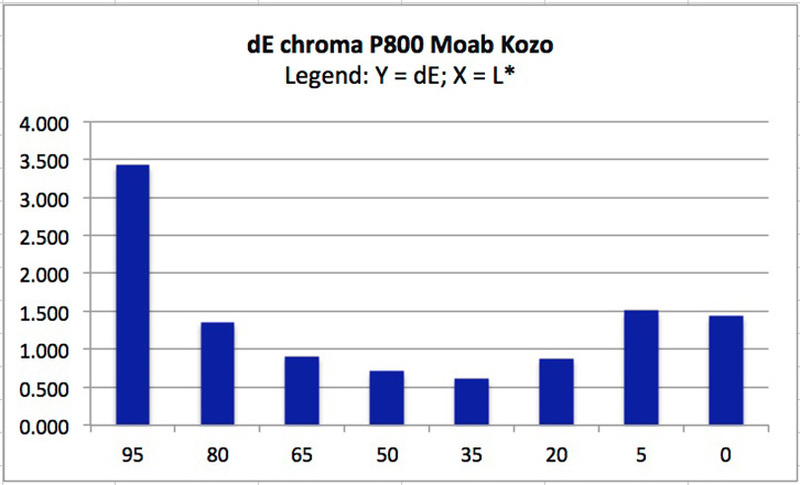 Finally, Figure 45 shows the Outback target softproof without adjustment for Moab Kozo. 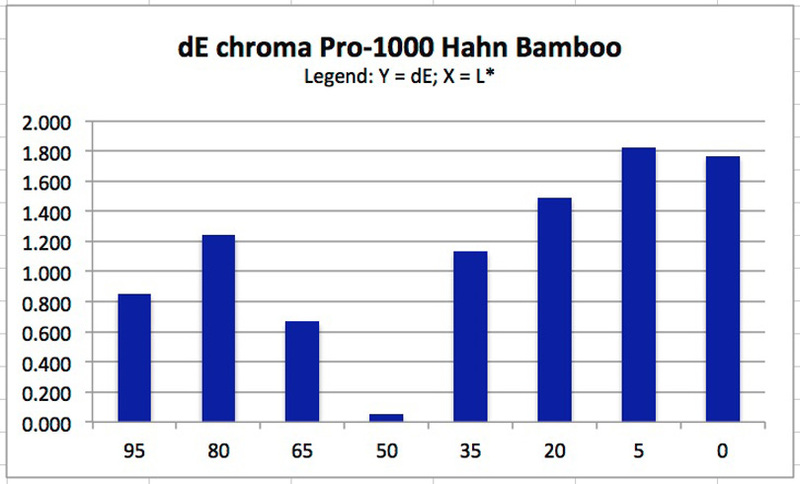 This is a considerably more muted outcome than that in Figure 31 for Hahn Bamboo, which has wider gamut. The ability to distinguish Black levels begins at about RGB Level 10. The Awagami Factory people are correct that this paper should not be evaluated as a traditional “Western” product. It is a specialty paper that should be used appropriately within its character and capability; the same for Moab Unryu. Most of what I said above about the usability of Kozo paper applies as well to Unryu, so I shall not repeat the story or the illustrations. There are however notable differences of appearance and specs. 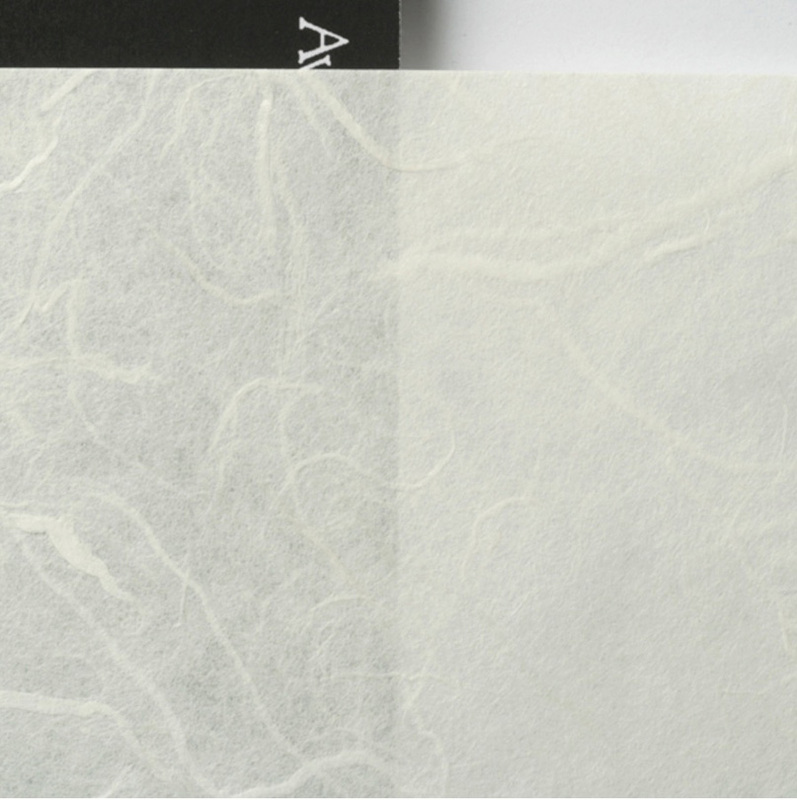 This paper looks much like the Japanese Washi on which Japanese print artists would have drawn their images (Figure 46, from the Awagami website), and being “cloud dragon paper”, it even has its own Logo (Figure 47). Very importantly – this is not an ordinary dragon – it is a five-claw dragon, which makes it a royal dragon in Chinese culture (but this is Japanese paper…. ), while ordinary dragons are limited to three claws. OK, moving right on, this is a light, thin paper, weighing-in at 55 gsm, with thickness of 13mm (5.1 mil). Instead of Letter it comes in A4, A3+ and several roll sizes. It is pH neutral with no OBAs. Notwithstanding how thin it is, the paper loads and feeds satisfactorily through the SCP800 and Pro1000 sheet feeders. I do recommend some “decurling” of the corners to keep them off the printhead as the paper passes through. The gamut volume of this paper is somewhat lower than that of Kozo, which is already low. Unryu ranges from about half to two-thirds of the gamut volume achievable with more conventional “Western” matte papers. This means it is a specialty paper preferably used for images where wide gamut volume is not an important consideration. Profiling accuracy is not good for either OEM or custom (Mark) profiles, ranging from a high dE of 6.7 (OEM, Pro1000), to a low of 4.2 (Mark, Pro1000), the SCP800 results falling in-between. 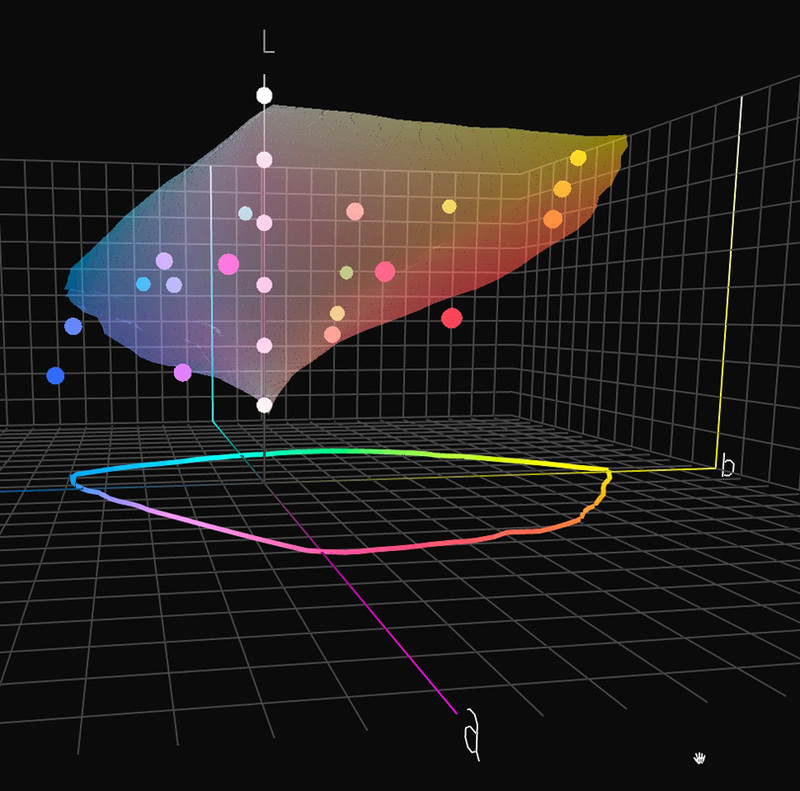 Figure 49 is a picture of the dispersion by colour that makes up the average dE of 4.2. 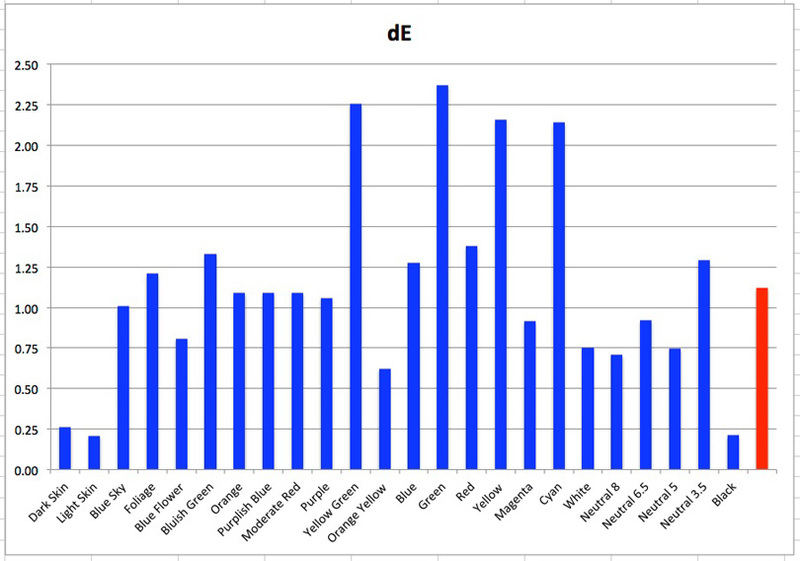 Considering how many of the colours are above dE 3, with several reaching into the range of dE 8.5 to 10.3, clearly, one is not using this paper for accuracy, but rather for effect. Perhaps the two main reasons for these outcomes are that (i) the paper does not lend itself well to accurate profiling, given the artistically intentional variability of the substrate, and (ii) the low gamut volume placing a number of GMCCTW test target file reference colour values beyond the printer/paper gamut. The White point measured from the brightest patch has an expected warm bias given the yellowish paper hue. Maximum Black differs, interestingly between the SCP800 and the Pro1000, the former being about L*17 and the latter L*21, whether for OEM or custom profiles. Black point neutrality is also better preserved in the SCP800 than in the Pro1000. For the grayscale in-between, it’s decent in the range of L*80 to L*5 for the P800 and L*80 to L*35 for the Pro1000 (Figures 50 and 51). A nice use for this paper could be to make greeting cards. 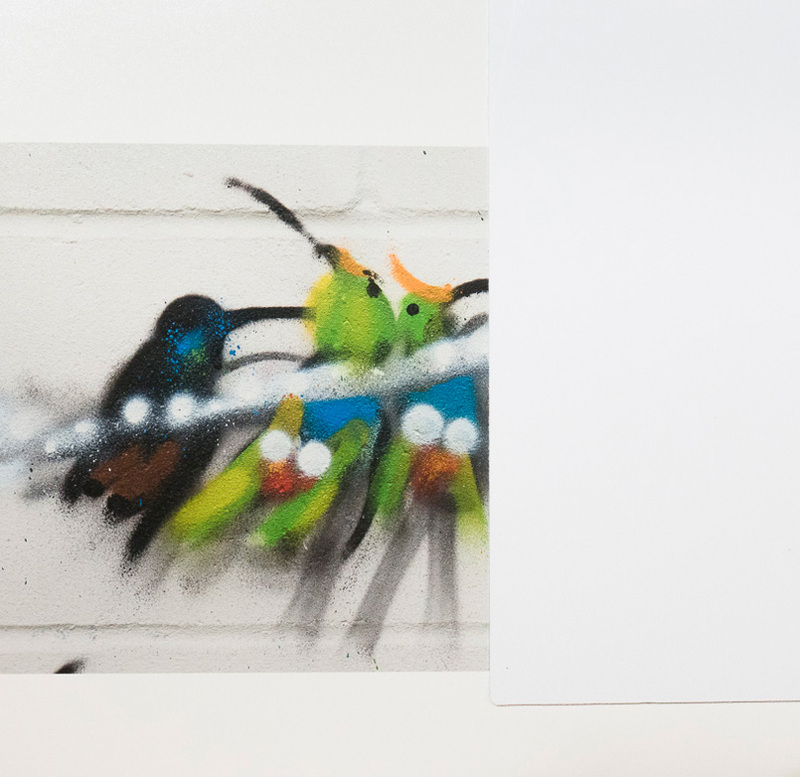 It can be folded flat for an envelope without cracking the paper, has a lovely texture and appearance, and is suitable for images that don’t need all that much gamut (Figure 52, photo from my shoot of Louis Masai’s Endangered 13). For this paper, while Moab succeeded in profiling it using an Isis2, I could not get my i1Pro2 to read the profiling targets. I was advised this is to be expected, so I have no custom profile analysis to offer. Figure 53 shows the data for the OEM profiles. The gamut volume is very low for both printers, being slightly better in the Pro1000. Profiling inaccuracy is extreme, most likely because of the low gamut volume relative to the colour reference values of the accuracy test target (similar phenomenon to that illustrated above in Figures 35 and 36 for the Awagami papers). There is an intentional blue/gray-bias in the White point, but the Maximum Black is more neutral. The maximum Black point as read from the paper is about L*2 in both printers, which is good by today’s standards for a Photo Black ink paper. This is a paper one uses purely for artistic effect. Figure 54 is a scan of a sample print that Moab provided, photo by Harold Davis. It’s difficult to reproduce in a scan the kind of effect that this paper renders, but this illustration gives one a notion of it. I also created several illustrations showing how it re-interprets “normal” photos into a low-key bluish/gray-metallic sheen (Figures 55 ~ 57). Figure 54. Moab Slickrock Metallic Sample Print – scanned for this article. The criteria for selecting these particular photos are that (i) they are relatively monotonic, (ii) therefore don’t need much gamut, and (iii) the subject matter is either metallic or shiny enough to lend itself to metallic interpretation. 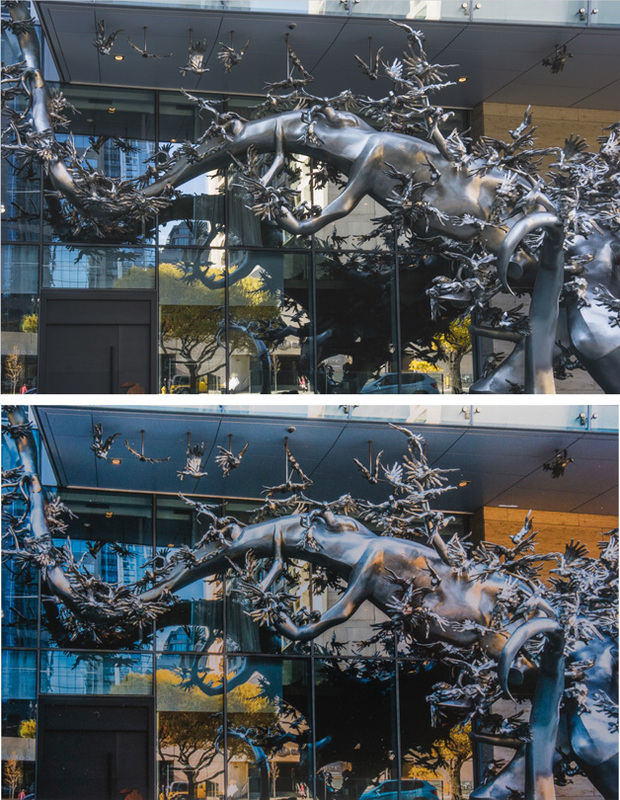 All of them, especially the B&W example, look better as prints than they do in this article, as it is elusive trying to reproduce the metallic effect in another medium. Working with this paper requires the right kinds of photographs and, given the gamut limitations, very careful tonal editing under softproof to achieve pleasing results from it. That said, for those who have such photos and wish to do something artistically original with them, this paper could be well worth a try.